Usining dapper live install beta 2, kernel 2.6.15-22-686 updated (2006-05-16), gnome enviroment. Ok, everything is installed. But when run 'k3b'->Settings->Configure K3b->Programs, Normalize and eMovix Applications is not Found. but is not that k3b lookup. Just a heads up about the emovix not being found. You have to install the debian package from the emovix sourceforge.net page http://sourceforge.net/projects/movix/ choose the emovix download then the debian package. This installs the required files to create emovix CD images. I think the problem here is really that people aren't interpretting the problem correctly. It says that the emovix files can't be found because it's looking for the image files not a program as such. Movixmaker-2 doesn't seem to install the emovix files as I think it uses the same steps as emovix to create the images using the same programs as emovix. This make sense? Even though the debian package installs faultlessly, perhaps this debian package could be included in the same ubuntu repos as mplayer, etc? I confirm this. K3b on feisty can't find normalize. Normalize-audio is installed on my system. I can confirm the bug related to the normalize-audio call. Tito' solution works for me on feisty. Both bug and fix confirmed for normalize. I forgot to mention that you have to rename the program to "normalize-audio" from "normalize" after the installation. I'm sure you can change something in some Makefile, but have no time to check. In my opinion it's the k3b that should be modified, not the normalize! Does the problem still exists in gutsy? As reported above installing the emovix package from sourceforge fixes the eMovix not found problem. However, the newest version of the emovix package (0.9.0-1 dated 27-06-2005) depends on cdrecord. Since k3b now uses wodim instead of cdrecord then cdrecord is not installed on Gutsy, at least not on my system, see terminal output below. This means users have to install a useless package just to satisfy this dependency although this is probably more of an upstream issue. Selecting previously deselected package emovix. Package cdrecord is not installed. Need to get 1306B of archives. After unpacking 41.0kB will be used. 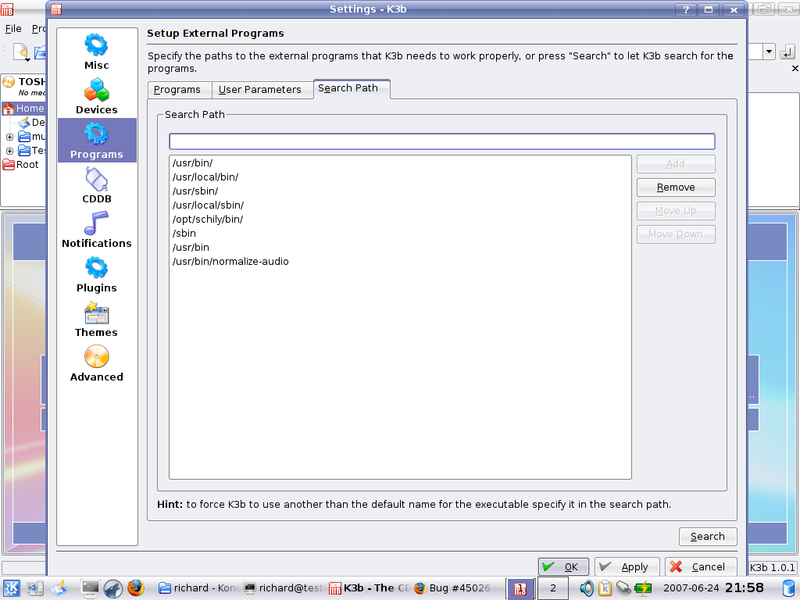 Selecting previously deselected package cdrecord. for normalize-audio in gutsy it should be ok! i've make a patch for it! for emovix-2 i was not able to solve it. must be made before we can proceed. not sure why (new to linux) but my normalize was installed to /usr/local/bin directory in feisty. Out of the box in gusty, normalize-audio is _not_ found. Adding search path with full path does not work either. normalize-audio is installed in /usr/bin via normalize-audio package. normalize-audio problem is fixed in gutsy. I am new to Ubuntu and can not figure out exactly What I need to type into the terminal to make the necessary changes to Normalize-Audio (which I somehow figured out how to install) and correct the program so K3b will recognize it with Tito's Feisty Fix. Can someone make this clear to a newbe like me? Just to verify, eMovix working in HH based distro (UltimateEdition1.8x64) after installing via .deb as per cyberfin (aboves instructions) BUT had to add /usr/share/emovix to the path search before K3B would find it. I'm running KUbuntu 10.04. Installed "normalize-audio" from the standard repositories, however it reports the binary via -V arg switch as "normalize 0.77". Downloading the normalize code, and making the fix to src/normalize.c fixes the issue. Had to 'ln -s /usr/local/bin/normalize /usr/local/bin/normalize-audio'. Set the PATH in "programs" to use /usr/local/bin before /usr/bin, then did "search" again. This is annoying that an ancient bug like this crept back in. However - awesome program - thanks! I have the same problem with Ubuntu 10.04. I would like to reopen this bug as it seems to be related also to Lucid Lynx 10.04. 1: The emovix problem can be repaired by manually downloading the emovix-package from Sourceforge and installing it. 2: I did not find a solution for normalize-audio. Simply creating a link named "normalize" as described above does not work here on Lucid Lynx. http://sourceforge.net/projects/movix/files/eMoviX/0.9/ - On this page you will find a .deb-package. Maybe emovix might also need a "needs packaging" ! ? Yep, this error happens in Kubuntu 10.04. Changing the k3b search path to /usr/bin/normalize-audio does not fix the problem either. K3b cannot find it even if you select that path in its settings. Restart K3B - it should work fine now. But why from many years bug exists, it's not corrected? When I use Vanessas script, the normalize-audio version shown by k3b is 2005 instead of 0.7.7. The problem seems to be that it takes the version from the second line output by "normalize-audio --version". Please find attached a modified script. This is the stupidest bug ever. K3B executes "normalize-audio -V" when searching for normalize and expects the response "normalize-audio 0.7.7" or whatever version you have. 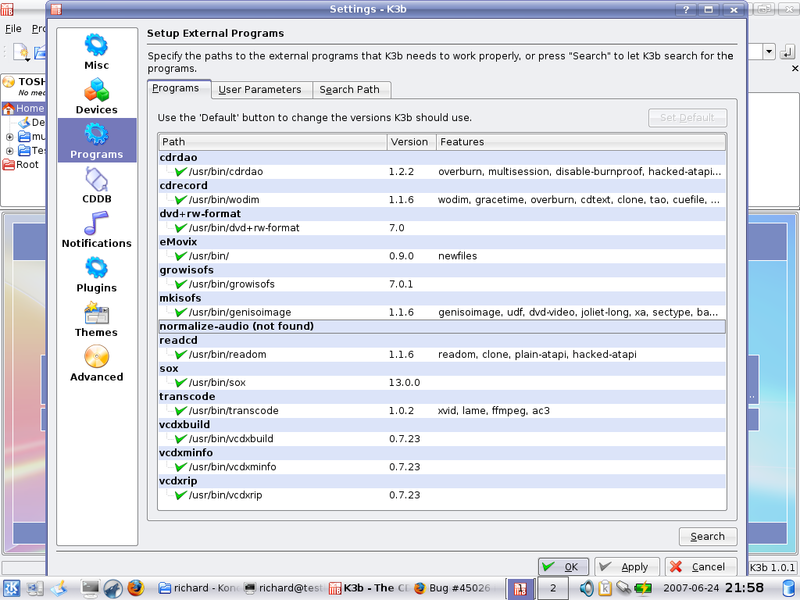 In stead, normalize replies "normalize 0.7.7" because the program is called normalize in the first place. All that has to be done is to change K3B to look for the correct version string. Done. It's ridiculous that a short text string mismatch has been a bug for four years. We shouldn't have to recompile normalize to get it to say what K3B wants to hear. :( There was a patch submission in 2009 that seems to address the issue, but the maintainers told him it was already fixed. (http://bugs.debian.org/cgi-bin/bugreport.cgi?bug=549221) Guess what? It's still broken. Argh. Please let this be fixed. Thank you Vanessa Ezekowitz for your fix. It works in my Ubuntu 10.10 amd 64. I would also like to thank Vanessa Ezekowitz for the fix. I am also running Ubuntu 10.10 (64 bit) and the fix worked for me. I am starting to wonder if this bug will ever be fixed? I tried the modified version of Vanessa'a script suggested by Torsten Knodt. It does indeed fix the mis-reporting of normalize-audio version shown by k3b as 2005 instead of 0.7.7. After a few years I tried this function (normalize audio) and of course it doesn`t work because of the bug. Is this so difficult to correct this ? in kubuntu 11.04 the problem is still here! Thank you Vanessa for the fix! Maybe you should be put on the payroll. It's really a shame! After 5 years all we have is a trivial workaround that could have been even implemented into the package itself! I'm pretty sure this has been introduced by Kubuntu not by the KDE team. And, as it happens more and more often, there's more attention on the theme colors or the appearance of the icons more than the real meat. My workaround is to use brasero! Will this be fixed in Pangolin? Thanks to Vanessa!!! this worked even with ubuntu oneiric!!!!!!!! thanks!! So, what's needed more to have an official fix? THIS BUG IS STILL HERE WITH A TRIVIAL FIX AVAILABLE! +1 for the bug, thanks for the workaround with the script. Someone please incorporate this into the package, this is ridiculous! Thanks to Vanessa and Torsten for the fix. It worked like a charm. Then it'd better to exclude orphaned packages than blindly include them in the dependencies. And a package dependent on an orphaned one is also in the short list for the exclusion.